The average price of existing condominiums in Tokyo rose by a miniscule 0.61% 2018, a sharp slowdown from y-o-y rises of 3.2% in 2017 and 9.32% in 2016. During the latest quarter, existing condo prices increased 2.19%. In fact the average price of new condos in Tokyo fell by 0.53% y-o-y in 2018, in contrast to a 13.19% growth in the previous year. Existing condominium sales in Tokyo fell slightly by 0.3% y-o-y to 37,424 units in 2018, according to The Land Institute of Japan, while sales of existing detached houses in Tokyo fell by 1.2% to 18,208 units over the same period. Likewise, dwelling starts in Japan fell by 2.3% to 942,370 units in 2018 from a year earlier. 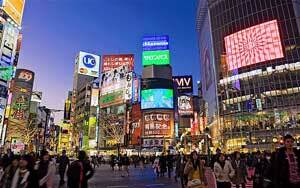 Tokyo apartment costs are high, at around $16,322 per sq. m.
Recent news: The Japanese economy slowed sharply in 2018, with GDP growth of just 0.7%, from expansions of 1.9% in 2017, 1% in 2016, 1.4% in 2015, and 0.4% in 2014, amidst the continuous decline in external demand. The economy is expected to expand by a miniscule 0.5% this year, as the country continues to face both external and domestic challenges, according to Fitch Solutions. The impending sales tax hike from 8% to 10% in October 2019, exacerbated by the still-unresolved US-China trade tensions, is expected to weigh on consumer spending this year.